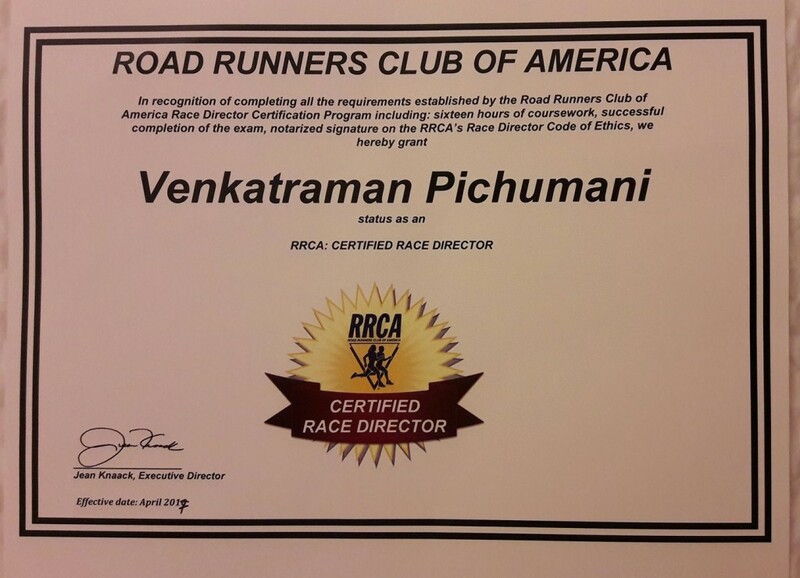 Proud to have been certified as India’s first Race Director by the Road Runners Club of America. Was handed over the certificate last night at the Convention dinner at Detroit. Last year I acted as a Race Director to a handful of races across the country. This role came about from my knowledge gleaned from having handled more than 300 running events in some form or the other over the last 3 years. It also came about from my having got the foreign team for SPBM for the last two years and also personally being part of the organising team at Brighton Marathon in April 2016. Since then I was keen to add an academic rigour to my hands-on knowledge. I found out that RRCA has a course to give such a certification. I enrolled, studied the syllabus, watched the videos and took the online exams. Also submitted an affidavit that requires me to honour and abide by the Race Directors Code of Conduct and Ethics.